​Watershed Descriptions: This document provides descriptions of the watersheds in the SSIRWMP region and their water management portfolios. All of these watersheds could benefit from projects designed to achieve multiple objectives such as: implementing strategic plans and studies for local water agencies, meadow restoration, fuel breaks and fuel treatments, comprehensive water studies, ecosystem restoration and invasive species removal. See the detailed portfolios for the Kings and the San Joaquin rivers. Please see also the maps page. ​Future Climate, Hydrology, Vegetation, and Wildfire Projections for the Southern Sierra Nevada, California: A climate change synthesis in support of Integrated Regional Water Management Planning, May 2014. Geos Institute. See also the climate change handout, below, which summarizes the climate impacts, vulnerabilities and potential adaptation strategies. 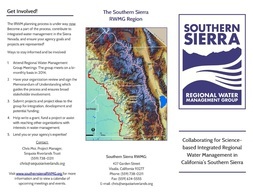 ​SSRWMG Brochure: One-page, trifold outreach document that introduces the public to the RWMG and the integrated regional water management planning process and details some of the RWMG's successes and accomplishments. The SSIRWM Process: Information about how the SSIRWM solicits, identifies, and prioritizes projects. For more information on submitting a project, visit the Project Submission page. The Regional Water Management Group compiles annual reports to use as outreach and educational tools, track progress toward reaching regional objectives and provide members and stakeholders with regular updates.